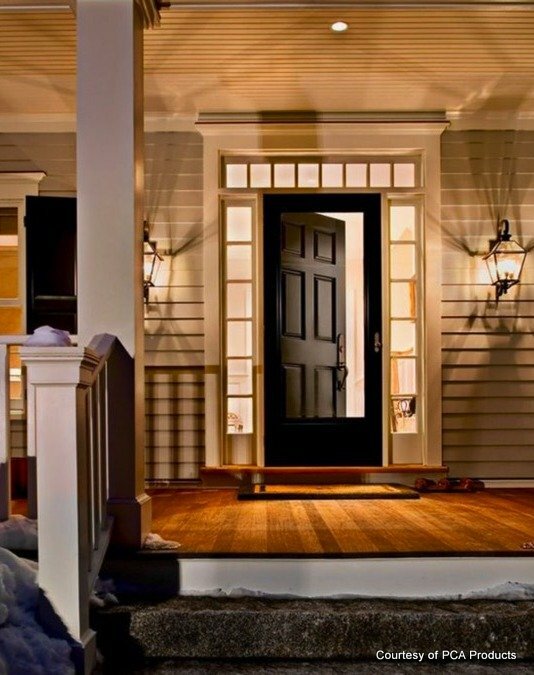 Are you looking for inspiring front porch designs and front porch ideas? Whether you dream of a country style porch, a sophisticated contemporary style or you only have a small space for a charming portico, we welcome you here to design, plan, decorate, and landscape your porch. Celebrating Ten Years with You! This porch is surely a favorite of ours and we've seen many over the past 10 years. 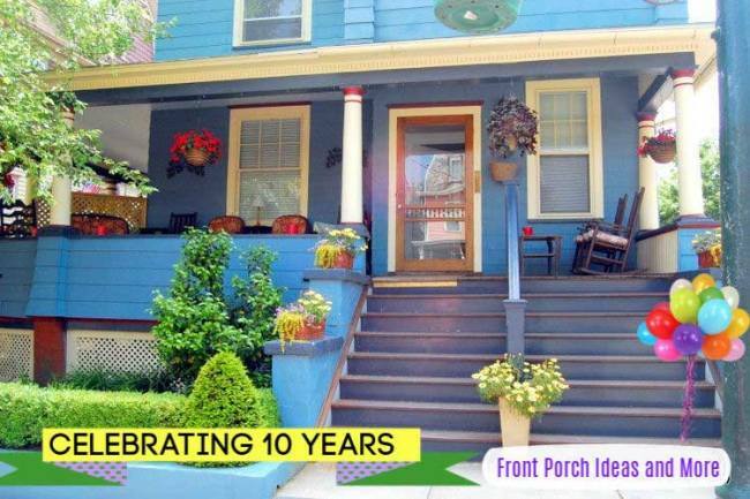 In our 100th newsletter, we are celebrating our 10th anniversary of sharing porch ideas with you. Truth be known, it's a bit more than 10 years now, but we are just now celebrating. We have YOU to thank for visiting our site, sharing porches with us, asking questions, enjoying our ebooks and so much more. Please take a quick moment to read our little story. 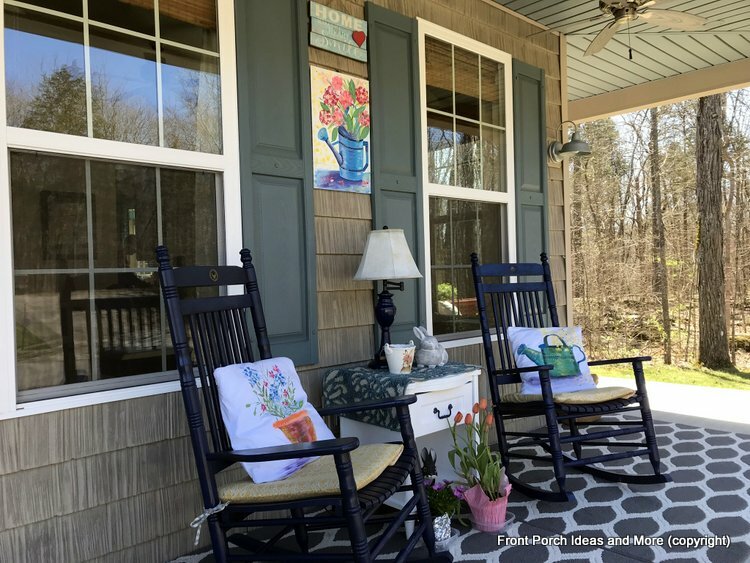 A glimpse of our porch for spring, the showy focal point is the watering can wall art that Mary painted. Also some colorful pillow toppers she just made. Well, it's still quite early and we will be adding some flowers and sharing more with you. Forsythias! 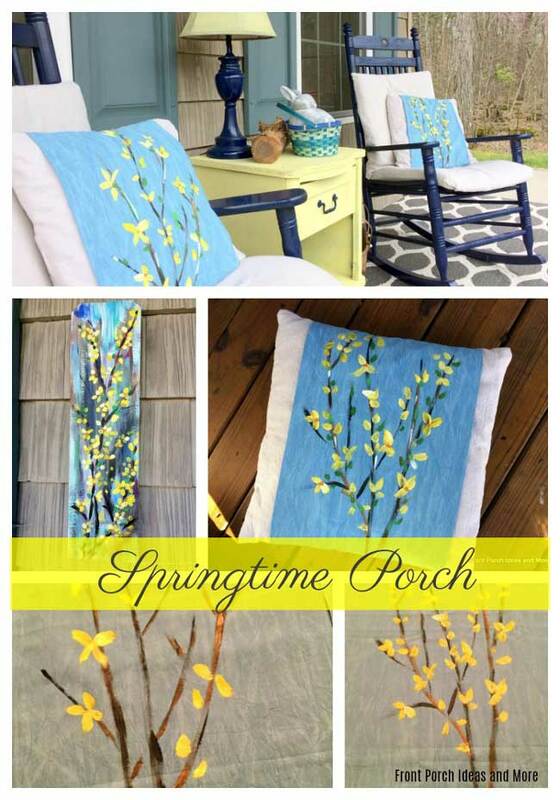 Who doesn't love some bright yellow forsythias? Did you see how we used forsythias in our decorating? Try this if you'd like to see more spring decorating ideas. A Porch That is Also a Storm Shelter? The two of us feel fortunate to have come across this concept of a porch that also serves as a storm shelter. Or it could be your deck, a stoop, or a raised patio area. If you live in a mobile home, manufactured home, ranch home on a slab - you get the idea. The product is named "SafePorch". Take a look! 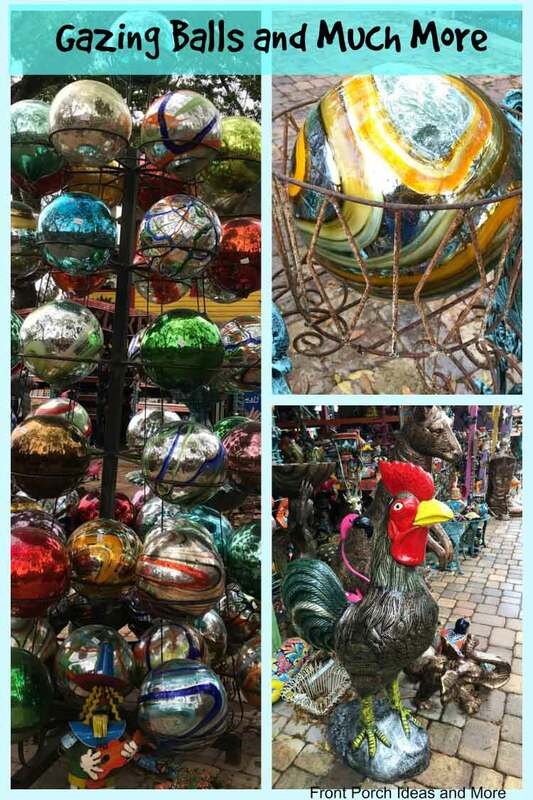 If you enjoy yard art and garden decor, this is the PLACE! Just driving by this emporium in Pierson, Florida is quite intriguing. Check out the pictures we took there. It only takes one step upon which to fall. Yes, just one. Do yourself or a loved one a big favor. Install one of these easy DIY handrails for up to 5 steps to prevent a serious fall. 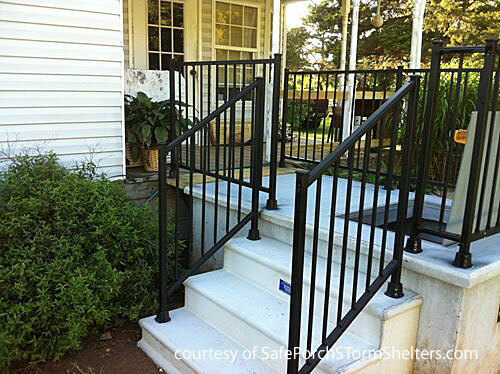 Metal handrail kits make it easy to safe-proof your porch, deck or stoop stairs. And they look fantastic as well. We are delighted that our readers are taking an interest in these handrails. Learn more about InstantRail and Iron X DIY handrails, highly recommended products that can save you and your loved ones from lots of pain! 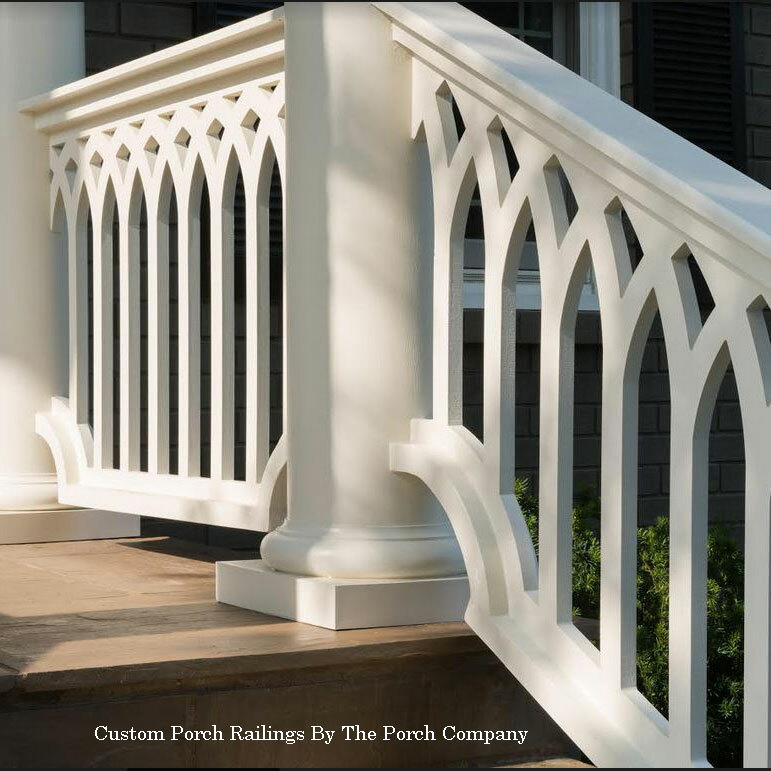 Please visit our porch handrails page for important tips and things you should consider. Watch our video; it has nearly 150,000 views! See our page with all the details of our DIY garden bench. This particular bench was made from a piece of cherry and it was crafted for a wedding gift. 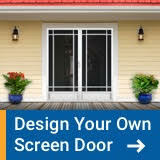 We are excited that our sponsor PCA Products is now carrying their screen doors in black. Please stop by to visit our page about their aluminum screen doors, including this new option in black. 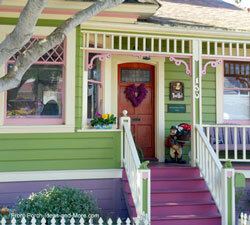 We've gathered pictures and ideas for enhancing your home with wonderful porch designs. Just 576 square feet in this charming cabin. It boasts of a vaulted ceiling in the living room with a plant shelf and skylight - and a pass-through kitchen for that nice open feeling. Many of us have the dream of living in a farm house in the country. Isn't this a beautiful one? We found this plan at Family Home Plans. We are proud to be one of their affiliates. 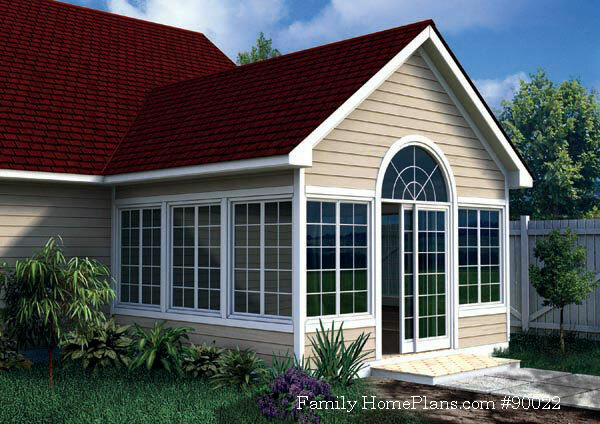 Did you know you can modify a house plan you purchase on line? See a plan you like? Need to move a wall, add storage, or expand the kitchen? You can do it and we know someone who can help! Listen to our podcast with Shawnna Steele, owner of ReDesign HP, an online company that specializes in making house plan modifications. 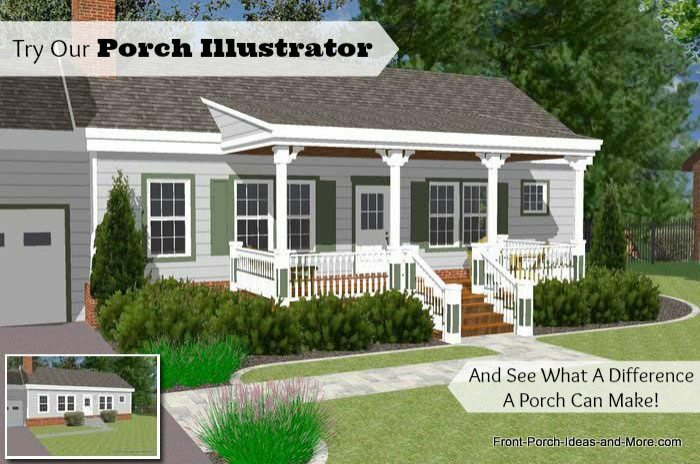 Use our very popular front porch illustrator to see how different porch designs affect the overall appeal of a home. 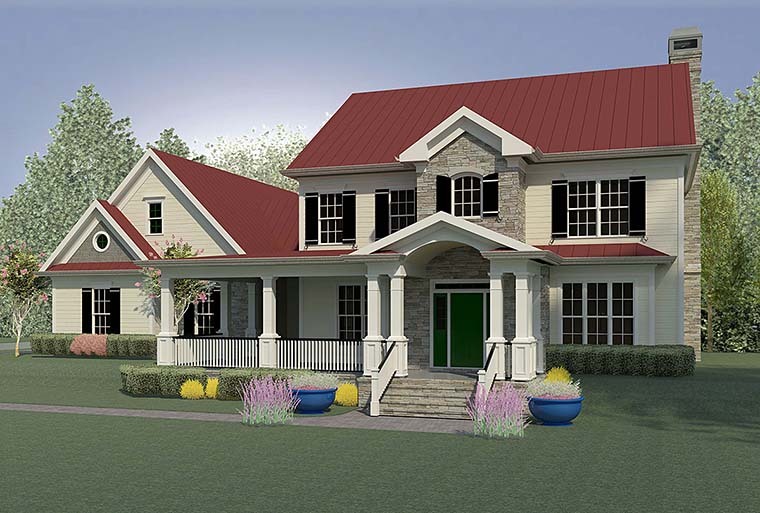 We show you various front porch designs on both a ranch and two story home to give you different perspectives. The right porch design can surely add lots of appeal and extra outdoor living space. Get more front porch design ideas! 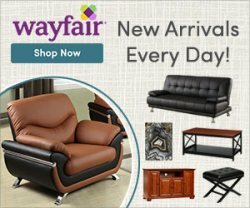 Now's the perfect time to select or create the perfect home plan and right here is great place to start. 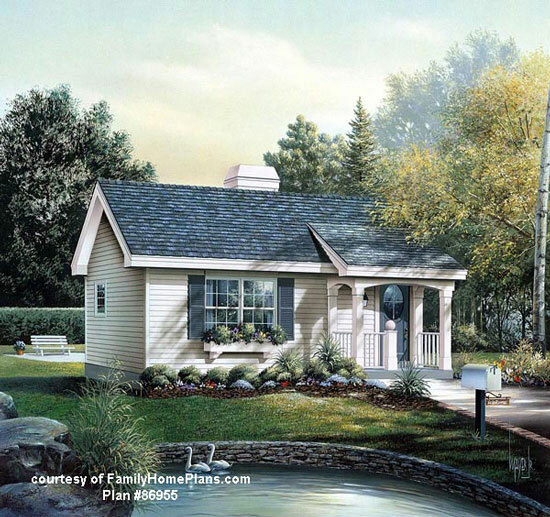 We are happy to show you home plans with fantastic porches in almost every architectural style but also many other options like storage sheds, she-sheds, outdoor projects and more. You can't go wrong with any or all of the following porch upgrades. Each adds beauty, value, and functionality! We are proud that our sponsors offer high quality products and services. Please see how they can help you. Instantly add beauty and style to your porch or deck with custom balustrades that require almost no maintenance - how neat is that! 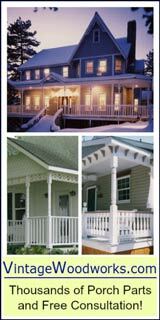 With the use of exterior house trim, you can create an amazing porch. Create lots of curb appeal quickly and easily with beautiful trimwork. Select from an array of many design options or create your own unique look. Minimum maintenance and built to last = more time to enjoy your porch. You've come to the right place! 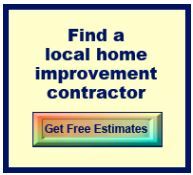 Use one of FamilyHomePlans.com screen porch DIY plans and build your own (or hire a contractor). 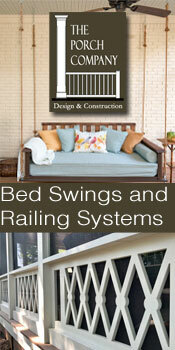 Start with a screen room and install screen porch windows from DIY Eze Breeze.com to create a three season room! 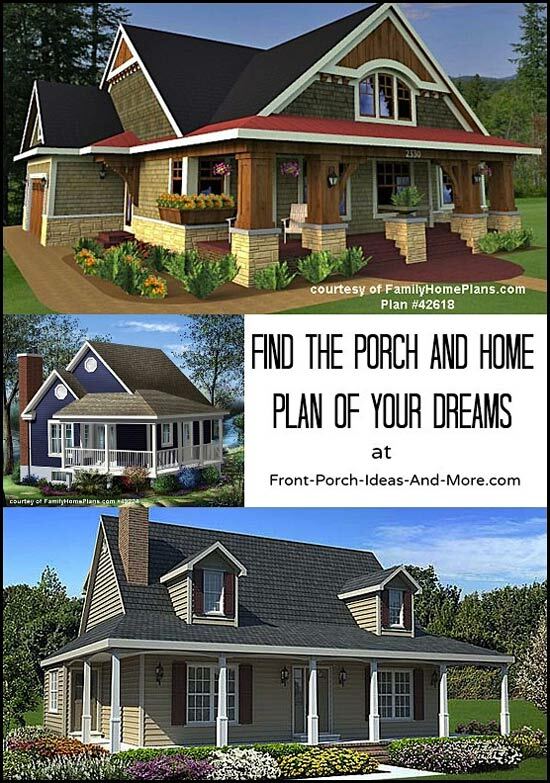 Select from a variety of porch plans on FamilyHomePlans.com (affiliate). Does one fit your home nicely? While we are an affiliate of Family Home Plans, the cost is the same to you. Please see our disclosure. People often ask us how to make small porches more appealing. 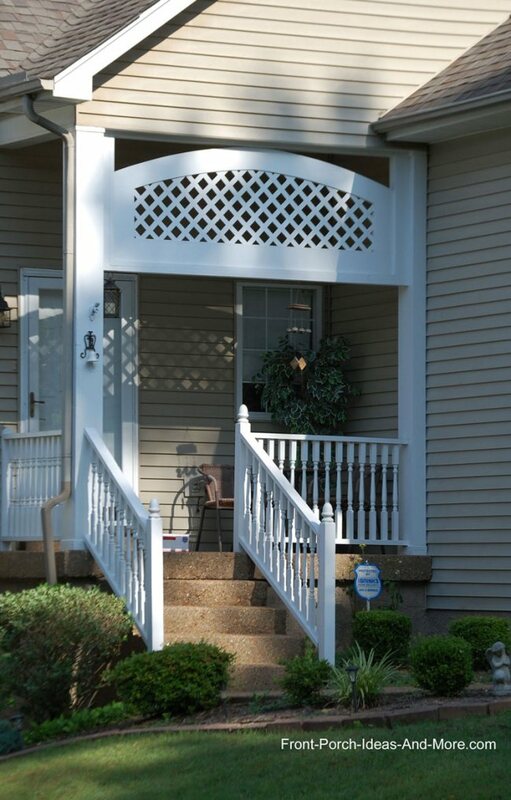 Here's but one example of adding a lattice panel between the porch columns to create both interest and curb appeal. 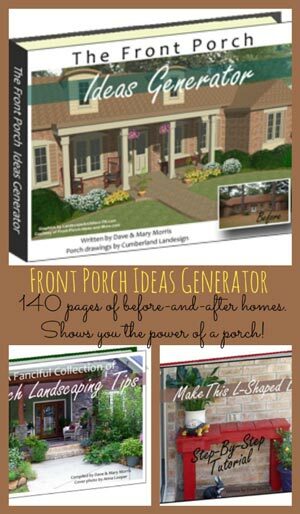 See more small porch improvement ideas! 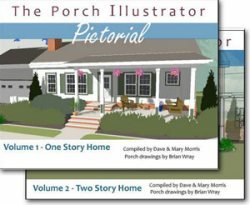 Have You Tried Our Porch Illustrator? 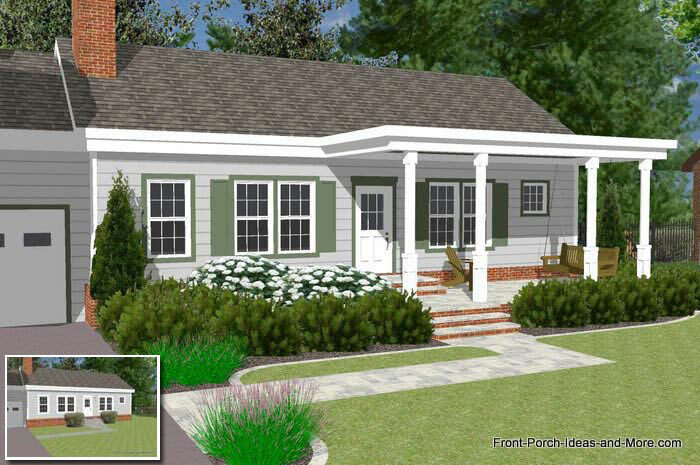 If you have a ranch home, our Porch Illustrator will give you some idea how various front porch designs would look on it. Try it for yourself. We also have a Porch Illustrator for a two-story-home, too. 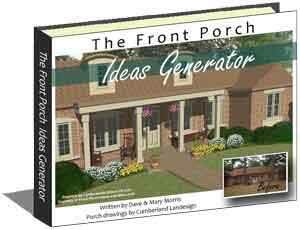 Both very helpful with planning your front porch designs. 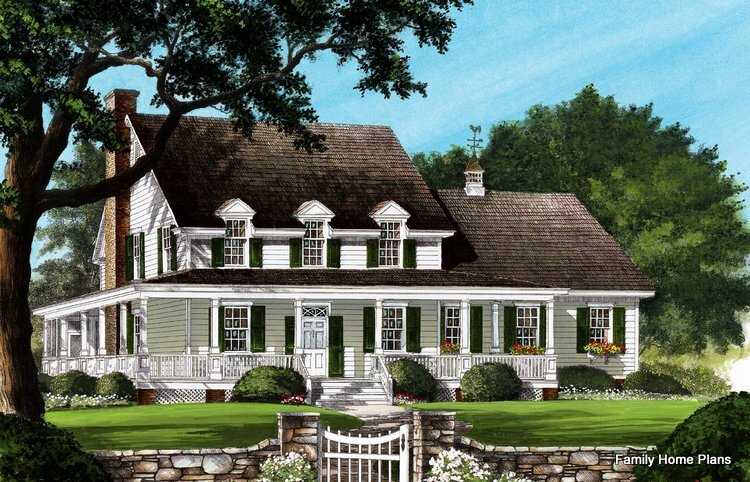 We get lots of questions about how a porch would look on a ranch or two-story home. 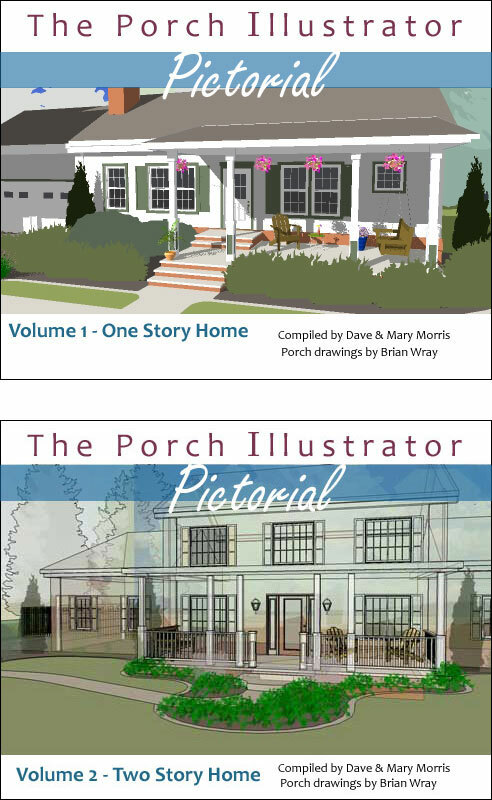 Take a look at our Porch Illustrator e-Book to see how a plain home is transformed with the addition of a porch. See more. As Dave and I have looked at homes over the years and strolled through neighborhoods, we have always been drawn to charming front porches. 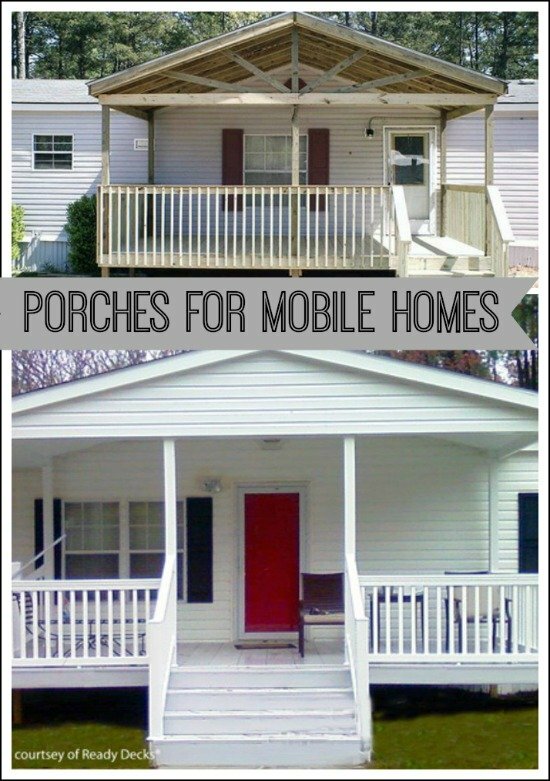 We've lived in homes with big porches, small porches and no porch (sad!). 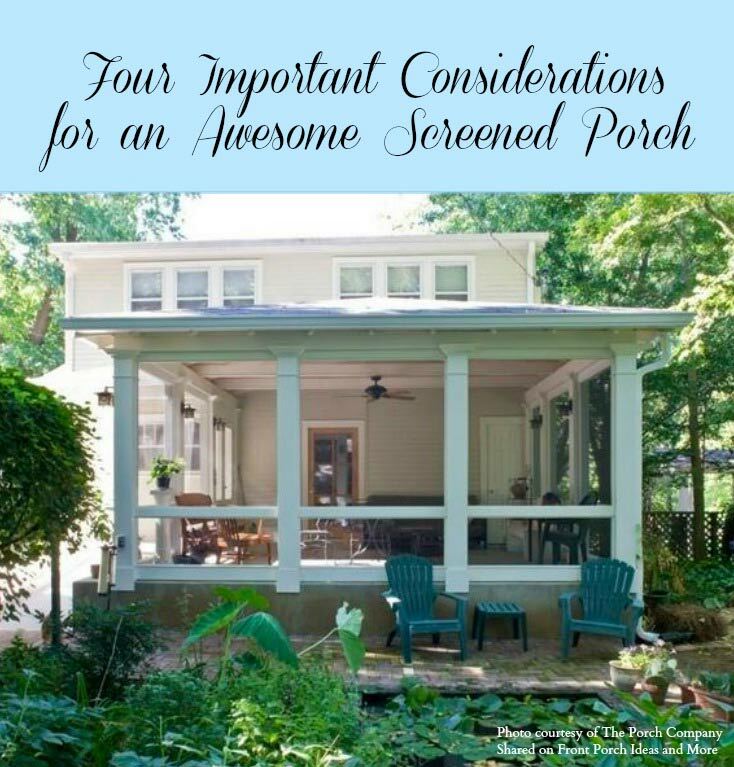 We once purchased a home just because it had a screened porch. And that was a terrific decision. 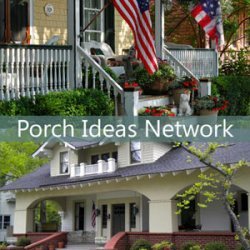 Dave and I use our passion to bring you the best porch decorating and design ideas for your front porch. 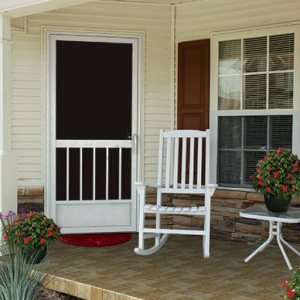 We hope that our front porch designs, decorating and entertaining ideas will help you whether you have a front porch, side porch, or a great back porch! You will find many front porch designs and porch pictures throughout our site. 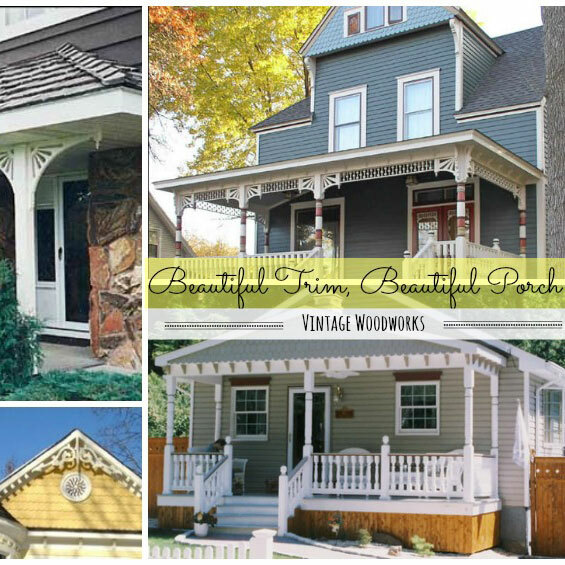 Our front porch pictures will help you visualize and plan your projects. Thinking of building or renovating a porch? From stone columns to renovating to building a new porch from scratch we have photo gallery pictorials to show you how it is done. Share your porch pictures with us!